Since I’ve been following a low-carb high-fat diet, I haven’t really found myself craving sweets. The pattern I follow includes a six-hour cheat window once every week or two. If I ever feel the need for something that’s not on my regular diet, I know that it’s less than a week’a wait before I can have it again. And honestly, on my cheat days, I generally find myself craving fats and proteins. But I’m not doing this alone. My husband is very fond of my baking. It may be one of the reasons he married me. And baking isn’t a big part of low-carb high-fat dieting. But there are a number of my recipes that he’s gotten used to over the years, and sometimes love comes in the form of food. One of these recipes is the moist, spongy tres leches cake that I used to make for him every now and then. 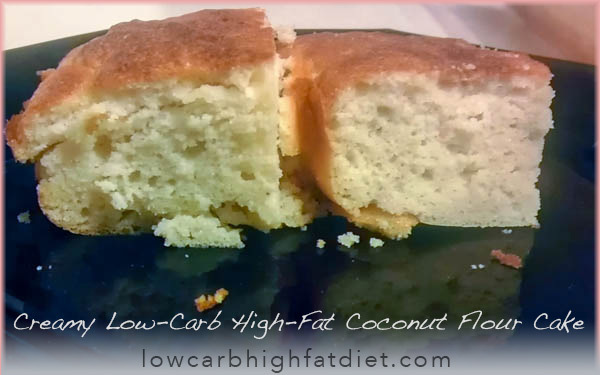 There are number of alternatives to flour for baking on low-carb high-fat diets. 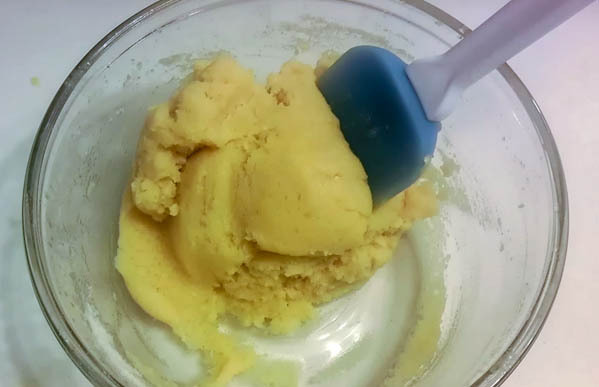 After experimenting with a few, the one that I’ve decided is probably the most practical for cakes and breads is coconut flour, made from very finely powdered dried unsweetened coconut meat. It has an even texture, only tending to be just a little bit grainy if you pay attention. It also absorbs liquid very easily, which isn’t a problem unless you’re not expecting it. But coconut flour is white and smooth, and it doesn’t take very much of it to add real body to a cake. I tried a few of the coconut flour cake recipes that I’ve seen on the Internet. The results have been a little disappointing. They tend to have a texture more like a quick bread than a cake. Imagine cornbread without the corn. They satisfy the occasional desire for something muffin-like, but not really for something cake like. So I decided to apply a few of my own baking techniques to the problem. 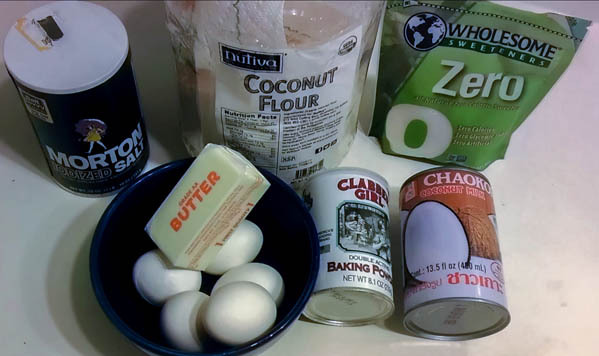 I started with coconut flour, erythritol, eggs, butter, salt, baking powder, and coconut milk. I think the coconut milk was the real secret to making my cake stand out from the crowd. It lends a creamy richness to the recipe, encourages the cake to rise, and makes the result very moist, while enhancing the healthy and delicious goodness of coconut. Erythritol is a bit tricky to cook with. It behaves just like sugar, but it’s not as sweet. If I’m going to use a sweetener, I generally want something a little more slutty. I like the way that Splenda, saccharin, and stevia just give it up when it comes to sweetness. You don’t have to poke around with your tongue to figure out if it’s sweet or not; you know that it’s sweet as soon as it touches your mouth. That’s what I like in a dessert recipe. But erythritol brings number of excellent qualities to baking, including the way that it caramelizes, and the way the dissolves in liquids. So I wanted to make this recipe with more erythritol, supplemented with some other sweetener. I decided to use Stevia. Separating the eggs is the other trick that I brought to this recipe. 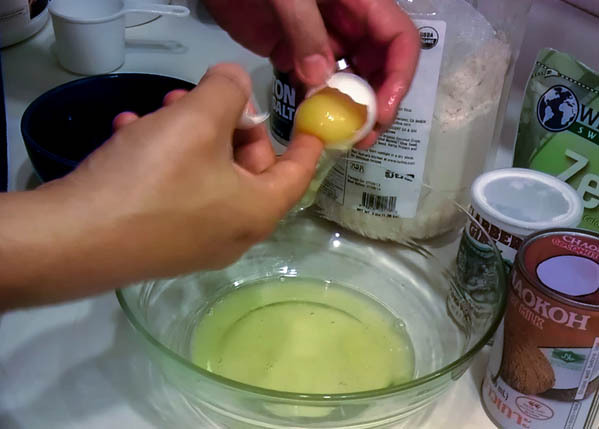 Most of the coconut bread recipes that I’ve seen just call for mixing the coconut flour into the eggs directly. 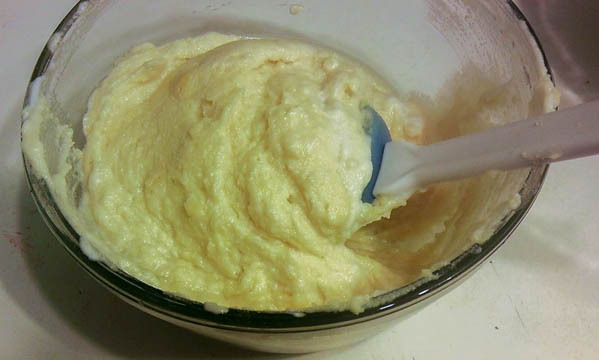 I decided to mix the yolks with the flour and the other ingredients, and then fold that into whipped egg whites. That, in addition to the baking powder, gives my recipe a lot of extra lift. The result of is still very dense, but not as bread-like as most of the other recipes I’ve tried. This is not a light cake, but it is a very fluffy cake, and very moist. 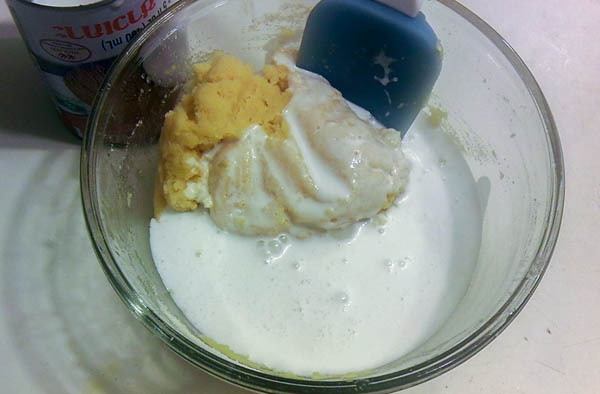 First I melted the butter, and mixed the erythritol in so that it will melt. I mixed the yolks in with the butter. 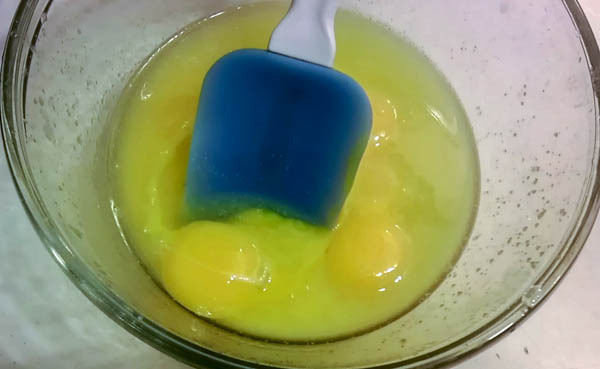 and mixed that into the egg yolks. 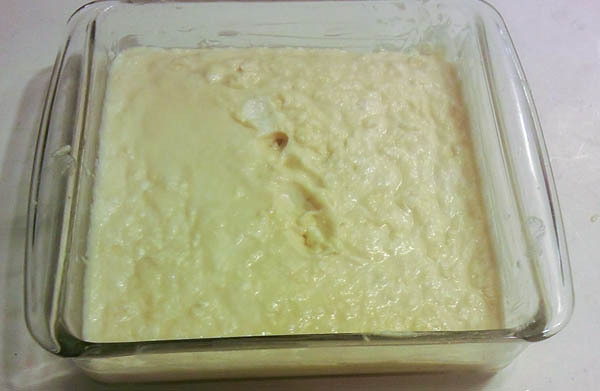 The resulting mass was similar to the dough that many of the other coconut flour cake recipes produce at this point. But half a can of coconut milk did a good job of lightning the egg yolks to a more batter-like consistency. 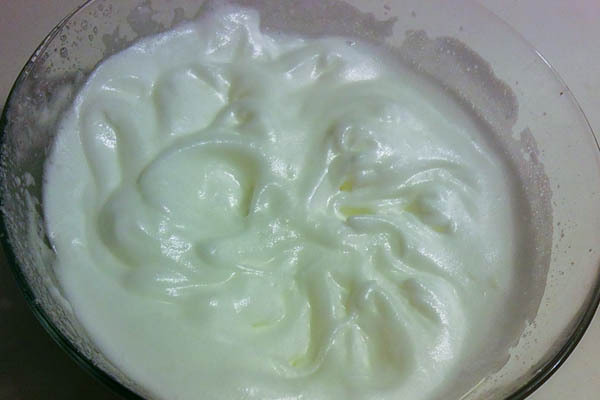 I whipped the egg whites with the cream of tartar. I knew the whites were ready when I could see stiff peaks. 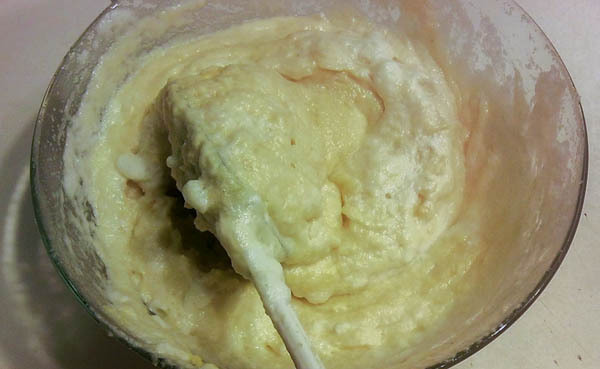 I mixed a little bit of the egg white into the batter to lighten it. 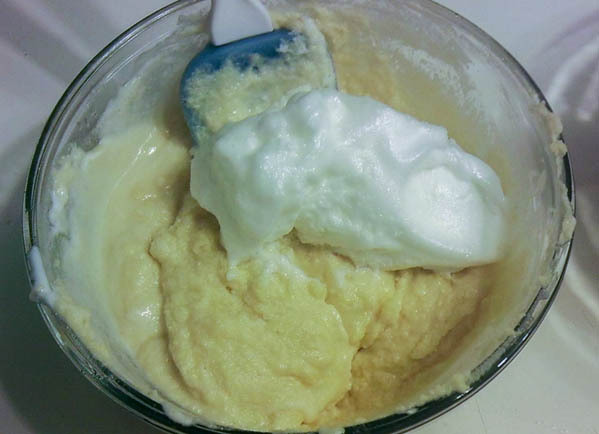 Then I folded the lightened yolk and flour batter into the whipped egg whites, gently. 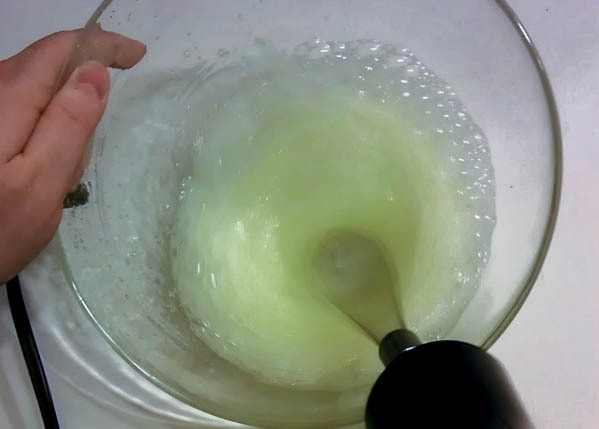 When using this technique, getting it fully mixed is not as important as being delicate, so as not to deflate the egg whites. I baked it at 350° for 35 minutes. 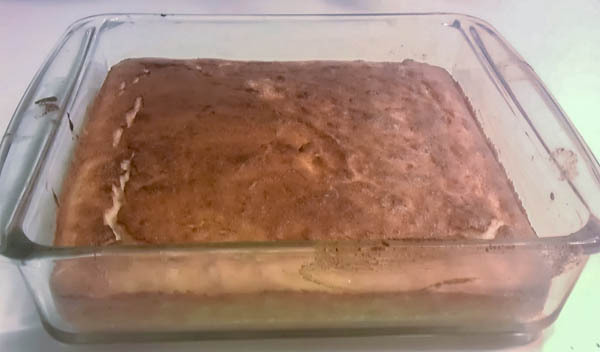 After cooling, I cut the cake into squares right in the baking pan. 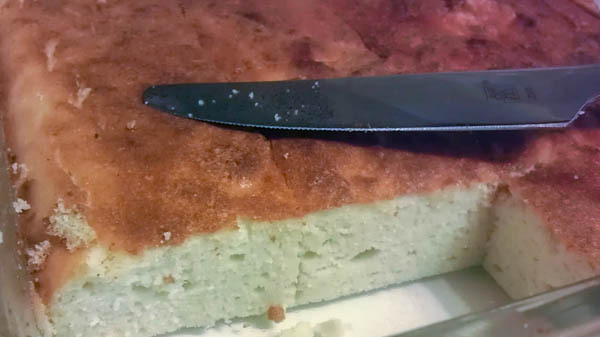 The texture is very cake like, and incredibly moist, even several days after making it. Just cover it with plastic wrap and store it in the refrigerator. If you like, you could also make a cream cheese frosting with powdered erythritol and butter, or just top it off with a little bit of raspberry purée. I’ve done some more tinkering with this recipe since I originally posted it, and discovered that the results are even more light and fluffy if you substitute 1/2 cup of almond flour for of 1/2 cup of the coconut flour. 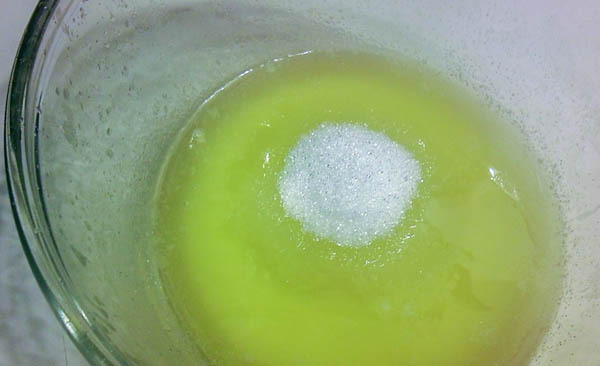 Including a half teaspoon of baking soda improves browning for a nicer appearance. Using multiple sweeteners enhances the natural taste. And a little vanilla or rum is a nice optional addition. I’ve edited the recipe above to reflect these improvements. Also, it turns out this works great as a loaf cake, like a pound cake, too. Just increase the baking time to about 40-45 minutes if you go for a loaf instead of a square sheet pan. How much cream of tartar do you use? And … are you using liquid or powdered Stevia? Which make of Stevia? There are so many versions on the market so it is really a hit and miss if you don’t tell the make. 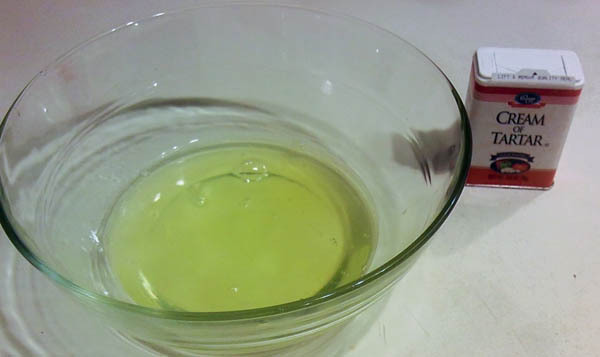 I find anything from a dash to a half teaspoon of cream of tartar works equally well. (In my experience, whipping egg whites isn’t the delicate science many might lead you to believe it is.) I’ve also updated the recipe to be more specific about the sweeteners. Thanks for asking! This was a screwed up recipe. First of all the recipe calls for powdered Splenda, (which I would never use anyway) And then in the directions calls for liquid Splenda??? Which is it??? 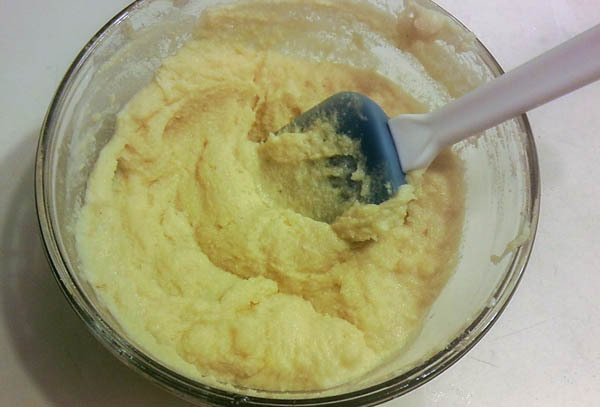 Secondly, the recipe calls for a half cup almond flour but does not tell you when to bring it in in the directions? 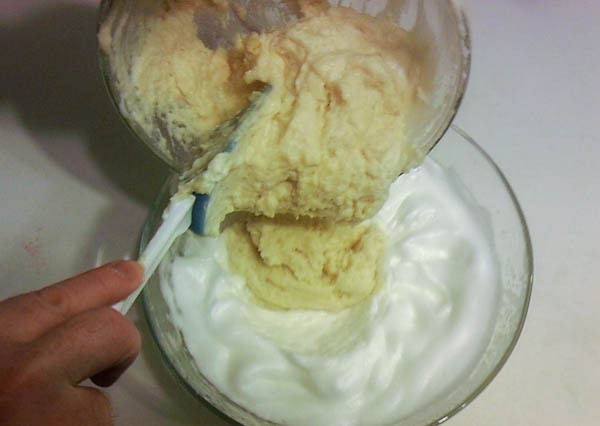 Thirdly, the directions state to mix the egg whites with cream of tarter and the recipe does not call for cream of tarter? Fourthly, My batter was very wet and not dry as your was. I assumed that this recipe needed more coconut flour which I added. I only used pure erythritol… no other sweetener. I used a half cup of coconut flour. No cream of tarter at all and we shall see how it turns out. My fault for not reading everything carefully before beginning Get it straight. Thanks for pointing out that liquid/powdered Splenda discrepancy, Joy! I’ve corrected it, and added cream of tartar to the ingredient list. 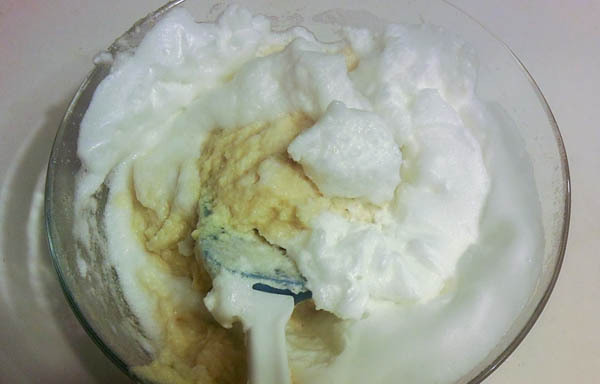 (It’s really optional, but it does help make the egg whites fluff up and hold their shape more easily.) Let us know how the erythritol version works for you. 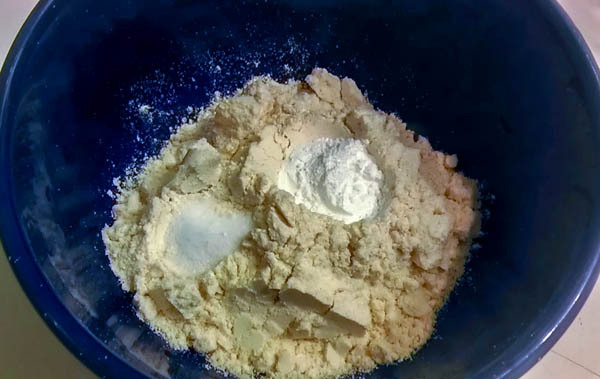 I wound up using a half cup coconut flour and the almond flour…no cream of tarter and I used 2/3 cu erythritol as you have pictured. It was GREAT. Erythritol worked great even with all the blunders. Great cake. Thanks…tonite for a Passover dinner I will make it served with raw whipped cream and a fresh blueberry sauce I make with a little grass fed butter and erythritol.